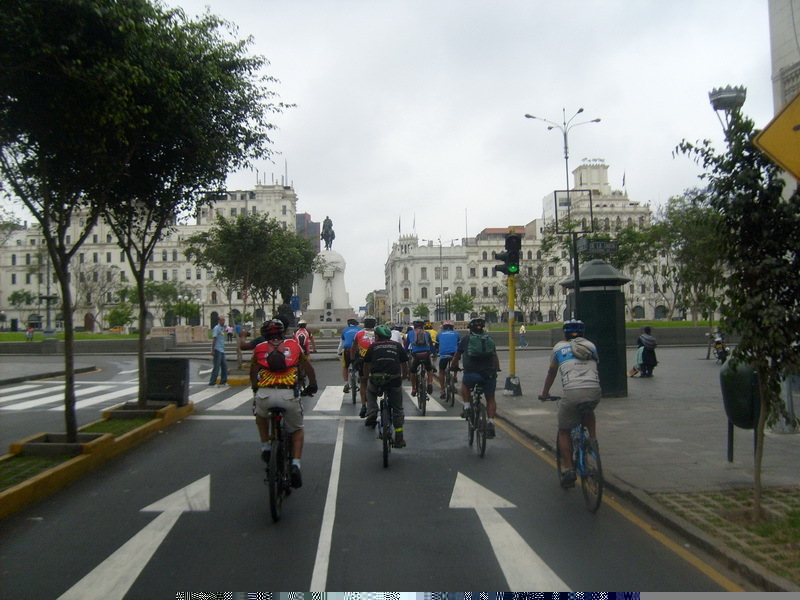 Cyclists in downtown Lima. Photo by Cicoloaxion. Lima, Peru is a megacity with a population approaching 9 million. It is notorious for its sprawling growth, vast slums and mobility issues stemming from a spike in car ownership and cab usage beginning in the 1990s. To deal with some of the problems in the country, The World Bank provided loans through the Transport Rehabilitation Project (TRP) to improve road maintenance and mobility of the poor , specifically women, by focusing on biking. Funded until 2000, the project fell down on a number of fronts, however, the city has taken on a renewed focus on mobility with its work to develop Metropolitano, a bus rapid transit (BRT) system in Lima, and biking activism is gaining ground, especially with a new law in Peru that gives priority to biking legislation. In the mid 1990s, The World Bank loaned $200 million to Peru, “designed to provide credit to low-income formal and informal sector workers to buy bikes, so they could access jobs.” Only those who could prove the bikes were used to access places of work were provided with the loans. The Bank thought the city was conducive to biking because of its flat terrain and mild weather, but a host of problems have hindered bike usage, including institutions and companies that failed to meet the requirements of the loan, like conducting outreach, and loss of funds, specifically for bike lanes. In 1999, only 2 percent of bikers surveyed in Lima were women, a possible indicator that there were some major concerns with cycling infrastructure construction, marketing and safety. In 2000, the Bank conducted a study that analyzed the differences in men’s and women’s use of two modes of transportation: bikes and buses. (View the PDF here.) The study found that the top four priorities for these types of public transit for women were security from theft and harassment, road safety (accidents), expenses and comfort. For men, top priorities included getting to the location quickly, road safety, order (schedule, routes, stops) and fares. The World Bank found that safety was such a major concern for women that it precluded them from traveling on certain routes at certain times in the city. And although bike paths protect bikers from traffic, they do not necessarily help women to feel personally secure when biking. The World Bank loans to develop bike paths in the industrial zone of the city also seemed to be more conducive to the travel patterns of male workers in the city. (You can view a current map of bike routes in the city here.) After a few years, the paths remained underutilized. Worse for women, the paths cross a relatively insecure area of the city. The World Bank also reports that outreach efforts around the construction of the new paths did a poor job communicating with women, specifically. Jumping to 2010, one activist group, Cicloaxion, describes Peru’s bike paths as “abandoned, underused or occupied by motor vehicles.” The group also claims that implementation was poor and not grounded in technical studies and analysis. It seems only now the bikers, planners and key actors are returning to reexamine the potential for biking in the city with the passage of new legislation and the increased focus on public transport in the city. However, one interesting and unintended result in the construction of bike paths was that small entrepreneurial businesses developed in some areas as people found job possibilities repairing and selling bikes. Other large Latin American cities, like Mexico City and Buenos Aires are working to get more people biking. A key indicator of the success of these projects will be the proportion of women riding bikes. CGI Live Blogging: Investing in Girls and Women...for Safer Public Transportation?